A Victorian Jar - The Best Boiled Sweets You’ve Ever Tasted - A beautifully elegant Victorian-style jar filled with our exclusive THE BEST YOU'VE EVER TASTED range of boiled sweets.... we've had some of our favourite traditional sweets enhanced and remastered, and the results are stunning. You get a delicious selection of Rhubarb & Custard, Strawberries & Cream, Kola Kubes and Pineapple Chunks. How Did We Create This Perfect Taste Sensation? We sought out a master sweet maker - a craftsman with many years of experience. And we set him the challenge to create the best sweets we have ever tasted (and we taste a LOT!). From the moment you pop one into your mouth you can really taste the difference. And this deliciousness is achieved with no artificial colours or flavours. 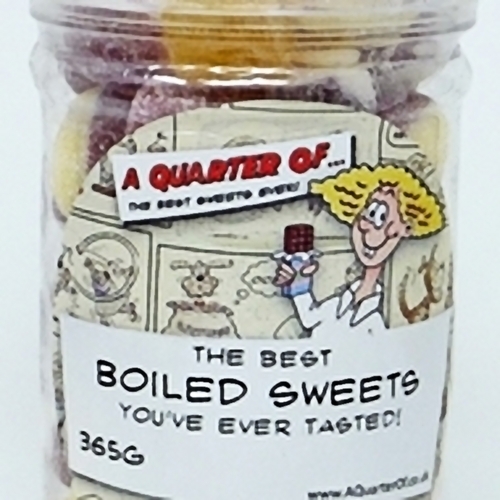 Each jar contains 365g (0.8lb) of Boiled Sweets (that's a lot of sweets!) and measures 17.5cm x 7.5 cm (that's 6.8 x 2.9inches).